Actually, this would be the Navy. And having been to this particular base, and driven past his very facility nearly every day for two years, it is very much still intact. Of course they did have to give the seamen a nice railing to make sure they didn't do this again. "Of course they did have to give the seamen a nice railing" Typical Navy XD! The orange diamond sticker on the front of the cradle, (the grey part the mine is held in for all you nimrods out there thinking it's a nuke) tells everyone that it's explosive. Not a dud. However, that isn't to say that it was |---| this close to killing everyone and their mother within an 80 mile radius. These things have to be armed people. And before they are armed, they are infact quite safe. Hope this little bit of learnification meets everyone's needs. Count your blessings and hope no one has a camera... to late doh!!!!! "Houston, we got a problem!" This wouldn't have happened if he was wearing a glow belt! "Don't worry guys, lets just do what the safety video instructs: RUN THE HELL OFF!" 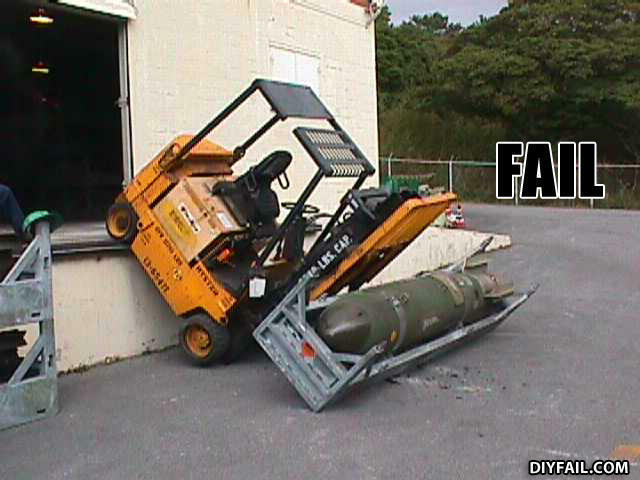 Tax payers, now you know how the Government spend yer taxes... on new forklifts per year! [beep beep beep beep beep beep] "What The Fu"--- BOOOOOOOOOMMMMMM!!!!!!!! !